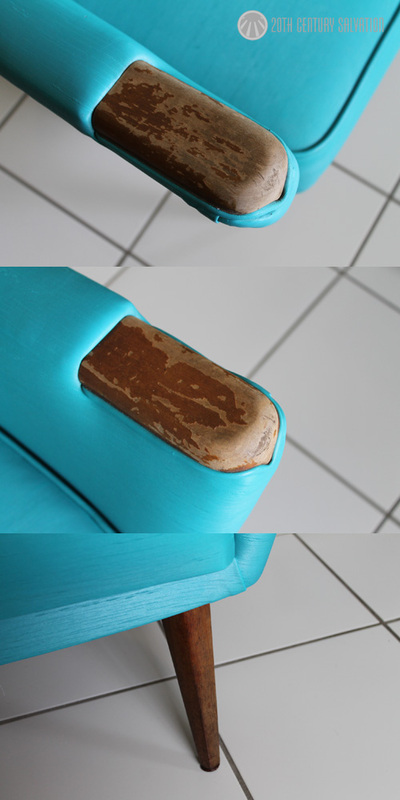 So I’m getting married in just over a month, and my fiancee and I decided that – weather permitting, we would use this great teal/turquoise coloured 2 seater lounge designed and manufactured by Kafka as our ‘love seat’. 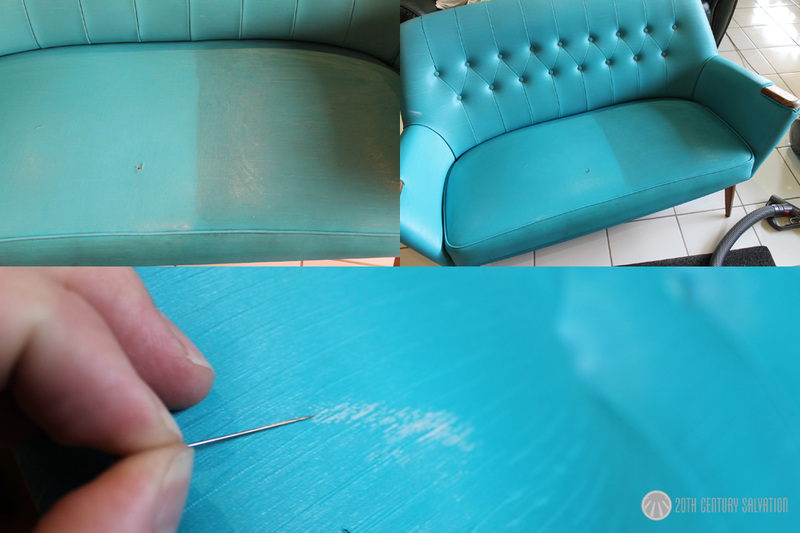 Being used solidly for the past 60 years has taken its toll (although small) on the lounge which is a little tired. Whats that mean? Well with time ticking away it’s time for a restoration, or perhaps more fitting, a ‘freshen up’. No, thats not a shadow! First of all comes a good vacuum, especially down behind the attached seat cushion. Although a little tight to get into, plenty of dirt and dust was removed. Then, and perhaps the most notable part – washing the vinyl covering. Nothing other than some warm water, soap, and a soft sponge produced the amazing result you see in the top 2 images (left half after – right half before). It’s crazy to think that that much dirt, grease and grime was there. The other side affect from giving the vinyl a thorough clean, was the overall feel. Before washing, the vinyl was hard to touch and stiff, yet after the wash it felt super soft and nice to touch again. It definitely revitalised the vinyl, and with a vinyl conditioner applied once dry, it will only continue to get better! Next was the stray white paint brush mark! With the vinyl having a very fine textured pattern, I didn’t want to use anything abrasive to try and remove the paint in the grooves, so I ended up using a super fine sewing pin to very gentle pick the white paint out of the grooves. Super time consuming, however it worked quite well! As you can see from the above picture, the timber hand rests have seen better days. The tinted shellac has started to flake off in places (like most shellac finished from the era) while the angular legs are looking a little tired. The combination of timbers here are interesting. The hand supports are manufactured out of coachwood, whilst the legs are teak. Coachwood is naturally a lighter coloured timber, hence why a darker/tinted shellac was used as the finish – to try and match the darker, solid teak legs. May pose some difficulties down the track but we’ll cross that bridge in time!